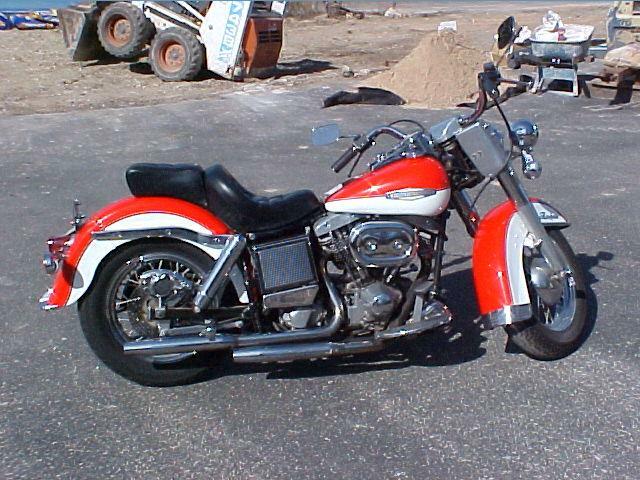 1973 Harley Davidson FLH Electra Glide. This is a very nicely restored FLH Shovelhead that needs nothing. It runs and rides excellent and is ready for many miles of fun. It has lots of chromed parts including the brake calipers. I don’t know who restored this bike, but they did a very high quality job. I got it from the state of Texas where it had been confisticated for some odd reason, and, believe it or not, used as an undercover vehicle before the State decided the poor thing had payed it’s debt to society and could be released. I just love vehicles with a colorful past............. It shows 230 miles which is probably the mileage since it was restored. I put in a new battery and changed the fluids, It runs great and is ready to ride anywhere. The motor appears to be fresh as well as the trans, tires, everything. It sounds very good. I wish it had whitwall tires, but since they are new Harley Davidson Dunlop radials, I don’t beleive I’ll change them, besides, the next owner would probably prefer blackwalls anyway, and for only $11,900, you’ll have plenty of money left over for whitwall tires if you prefer...........Well, my dear old dad always said a wise man changes his mind but a fool never does, so I went ahead and put the correct twin stripe whitwalls on it, and it looks like an entirely different scooter. That impressed me so much that I went ahead and ordered a new white leather solo seat with fringe, and new white grips and white rubber parts. It’s going to be even sharper if that’s possible......... Now I need $12500 for it, and I’ll even throw in those boring blackwall tires...... Call me at 512-784-3659 for an honest description. Fly in and ride this one home.